Using Analytics to shape your browser support policy. Or, when can I dump that bag of sh** ie6? I’m a web designer, not an SEO. So it took me a while to catch on to how Analytics might be helpful in my own work. But knowing and understanding the constraints you face is an important part of being a designer, right? And analytics gives us a useful window onto some of them. This is where analytics can help. Specifically, a relatively new feature of Analytics called ‘Advanced Segmentation’. A vexing question facing many web designers is “when can I dump that bag of sh** ie6?”. Well, using advanced segmentation, you can work that out fairly easily. Sadly, the answer for many of us is likely to be more nuanced that just dump it or lump it. I’m assuming here you have some basic understanding of analytics. 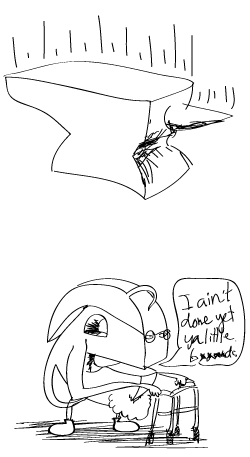 Don’t worry, that’s all I have too. If you want to learn exactly how to make an advanced segment, you should checkout Google’s help articles on the topic. All these stats were taken from our main ecommerce site cartridgesave. It’s a pretty busy site, so it gives us some useful data to work with. IE6 clearly lags in this instance; what was news to me is that IE8 is already beginning to overtake ie7. An encouraging sign, given how much better IE8 is from a development point of view, and how much faster ie8 adoption has been compared to the transition between ie6-7. Here is the same again, but swapping Firefox 3 for IE8. This information won’t necessarily solve the browser support debate, but it will hopefully lead to a more intelligent decision than before. Over the last couple of years, we’ve got heavily into agile methodologies – in particular, Scrum and Kanban. Here are three of our task boards, from three of our current main projects. This first board has evolved from a Kanban board introduced by Andy P. It features the Icebox, Todo, On Hold, In Progress (limited to 2 stories at a time) and a Review column. Done tickets are stuck to a nearby wall – with competitions as to who can get them the highest with a running jump! This rather messy Scrum board is a work in progress, and utilises the three windows between one of our offices and the games room. It features a full product backlog, a sprint backlog, In Progress and Done (‘Done Done’!). Team members like to place the postits below individual members/pair names so we’ve added this on. Our last board is a modest but effective Kanban approach for a small team. One thing that’s interesting with this project is that initially the team didn’t have a daily standup/scrum – but after using the board for a couple of weeks, they felt one would help them keep each other updated so started one. We’ve really felt the benefit of agile working, and the ‘informative office environment’ is a big part of it. I personally have a lot of love for tools like Pivotal Tracker, having previously used it on a big project – but there’s definitely something to be said for the tangible Post-It note plus Sharpie formula. Setfire will be sponsoring and providing the talks for the North West Ruby User Group (NWRUG) meet on the 20th of August, 2009. The theme of the evening is Capistrano, a technology we use internally to deploy production sites. We also actively support its development. We’ll start with a newbie guide to getting an existing site deploying with cap, and move on to some more advanced recipes. We’ll then move on to the much more important business of geeky chat and pizza, on us of course, and then, if experience is anything to go by, we’ll be off to a bar! Interested? Read more and sign up. See you on the 20th. 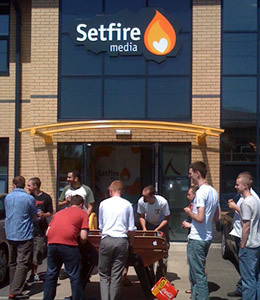 Are you Setfire Media’s first Technical Project Manager? Today, we announced a new role at Setfire – our first dedicated Technical Project Manager. This is an exciting move for us and is part of our continuing growth; we’re looking for somebody who can keep the machine running smoothly and bring a fresh perspective to our process and techniques. Do you (or somebody you know) love software development, working with both technical people and clients, and have a keen eye for process? Do you yearn for a laid back environment, free of corporate hassle, where you can get things done as part of a winning team? Then check out the Technical Project Manager job and apply! Send your covering letter and CV to recruitment@setfiremedia.com today.